The Horns of Alligin from the Deep South! 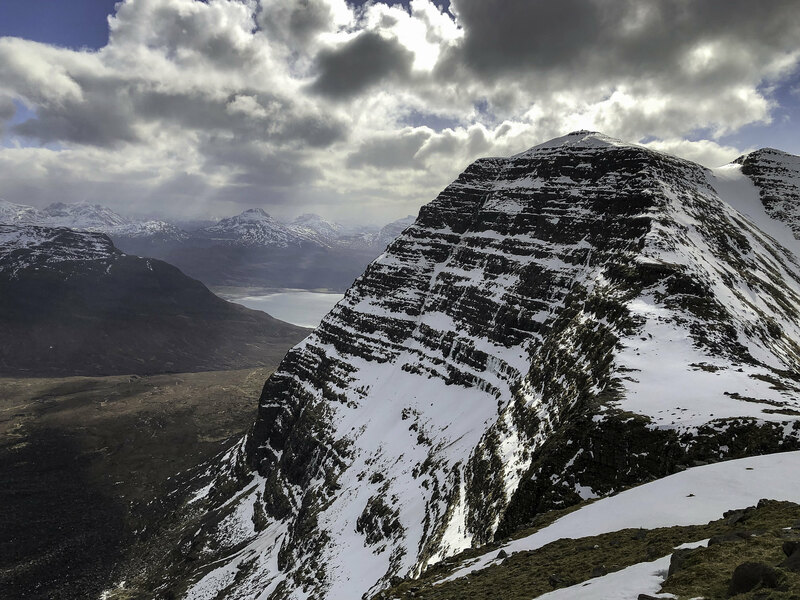 “What a place!” – You may hear this a few times during the video but if you’ve ever been to Torridon, you’ll understand why this phrase was used – A LOT! With the Easterly winds in control of the weather, west was best, and in fact the only place that seemed to be getting any sunshine this weekend was the North West Highlands! More snow was forecast for the eastern side of the country down to sea level so I made the decision to head to Torridon! I had already driven 150 miles on the Saturday (following a family day out) before I even started packing the car and setting out for my adventure. A further 200 miles later and I arrived in the Beinn Alligin car park at 9pm and got ready to settle down in the back of the car. A rather cold night followed and despite there being a million stars in the sky as I fell asleep, when I woke it was cloudy, snowing and a tad breezy!! My plan was for Deep South Gully a route that I had wanted to tackle for some time. I remember seeing its deep gash from the northern slops of Beinn Dearg on a winter traverse a few winters back and it looked amazing! 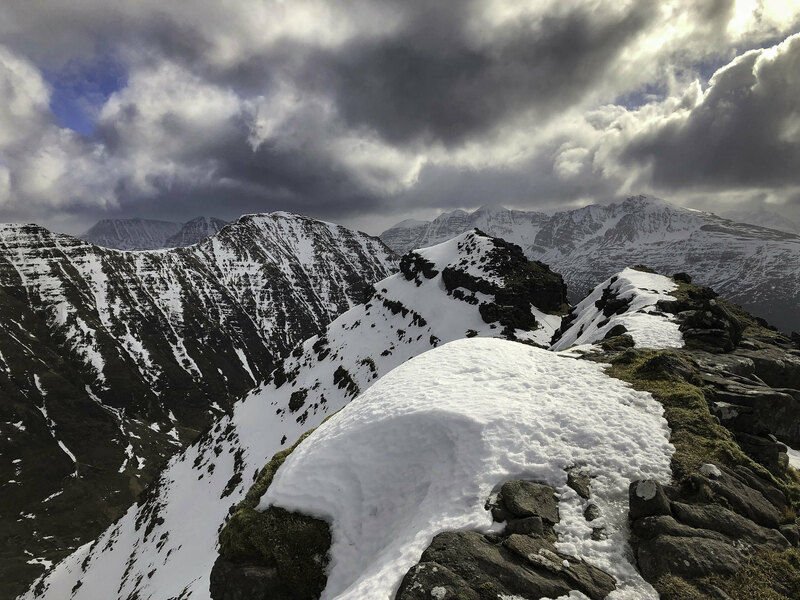 The timing seemed perfect as no new snow had fallen in the area and a thaw earlier in the week had turned to cold frosty weather – hopefully freezing up any soggy snow held in the gully! The avalanche forecast for the area was on the lowest rating so I was really looking forward to this  I was also eying up a traverse over The Horns and two Munros however due to the high winds I was unsure as to whether I would continue round The Horns of Alligin to complete the traverse or come back down via the first horn – only time would tell what the winds would be like on the ridge! I eventually dragged myself out of bed and faced the cold, brewing up a coffee as soon as I could! 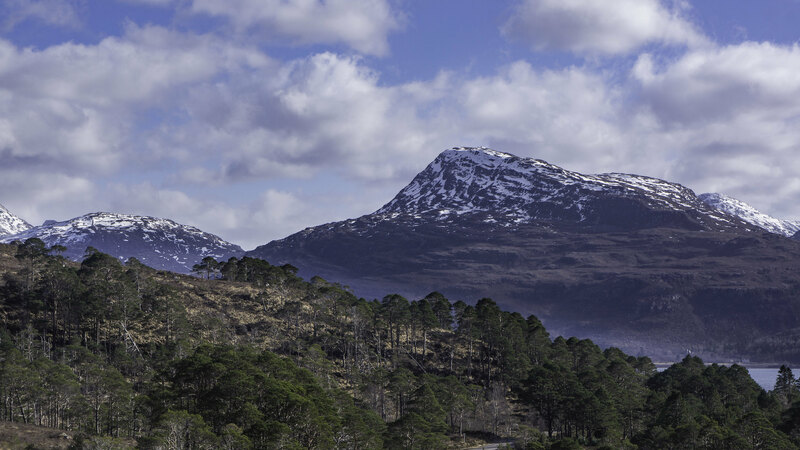 Soon I was striding along the NTS path with Beinn Alligin revealing herself, she was looking might fine – a Jewel indeed. I was heading up the same path I had taken to gain Beinn Dearg on a wonderful winters day a few years ago. The landscape was looking great however there was something missing here- snow!!! It was a bit thin to say the least (read no snow below 750 metres!!) and I was starting to worry that I was going to be trying to head up a rocky gully!! You can’t see the gully when approaching from this direction until it opens up in front of you, and when you get to this point, you really cannot miss it!! A deep chasm on the side of Na Rathanan and today the snow was indeed there in fact it was spilling out from the gully leaving a large fan in the glen (I just couldn’t see it on the approach!). It’s not a place to rush up and I stopped many times to take in the atmosphere (and get the camera out!). Massive ice formations decorated the chasm walls and the views back through the slit of the cleft were , well “Torridonian!”. As the gully trends right its starts to steepen and in lean conditions I had read that there are a few chockstones that require a squeeze through. Not today, these were well and truly buried! The climb to the top was magnificent and as with most gullies the gradient steepened further as I neared the top. What a place to be! Soon I was standing between the first and second horns and the views were incredible. A decision now had to be made on whether to continue round the traverse or have a short day and head back over Horn number one! The winds didn’t seem too bad so I decided on the traverse! Before long I realised that this was the correct decision. The scramble over horns two and three was fantastic. Striding along the airy ridge to the summit of Na Rathanan is amazing and I would have been happy had I called it a day here! The scrambling was grand and the views even better! Next up was the steep pull to the highest point of the day – Sgurr Mor. The high winds arrived as I gained altitude, but with them being easterlies, they helped push me towards the snowy summit! It was grand to be back here and it brought back memories of my last visit to the summit – a wild camp with a visit from the aurora borealis! 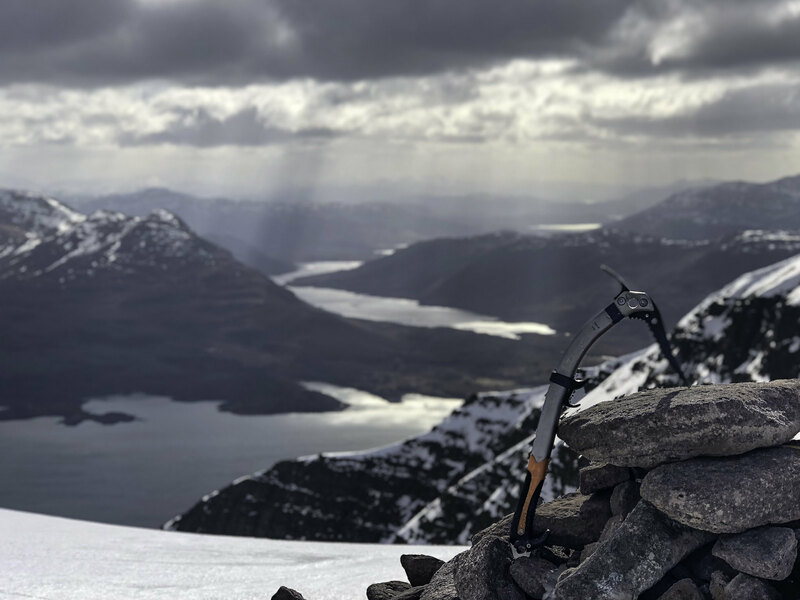 However on this occasion the winds saw my visit to the summit as a brief one and I was now being pushed and blown back down past the Eag Dubh – care was required as the gusting winds were knocking me about now! Didn’t fancy a slip down the Black Cleft! As I reached the bealach I found a sheltered spot and in the sunshine , it now felt like spring! A short break for lunch and I was soon scrambling my way to Tom na Gruagaich. It was still relatively early and I had been lucky that I had only met one other party when descending Sgurr Mor. On the top of the second Munro I met some other lucky people who were enjoying the snow capped views and blue skies, including Mike from Mountain and Sea Guides. It was great to catch up with Mike as I hadn’t seen him in nearly ten years. Re: The Horns of Alligin from the Deep South! Wow. Amazing. Superb. Nowhere in the world like the Highlands of Scotland. Great report and vid. 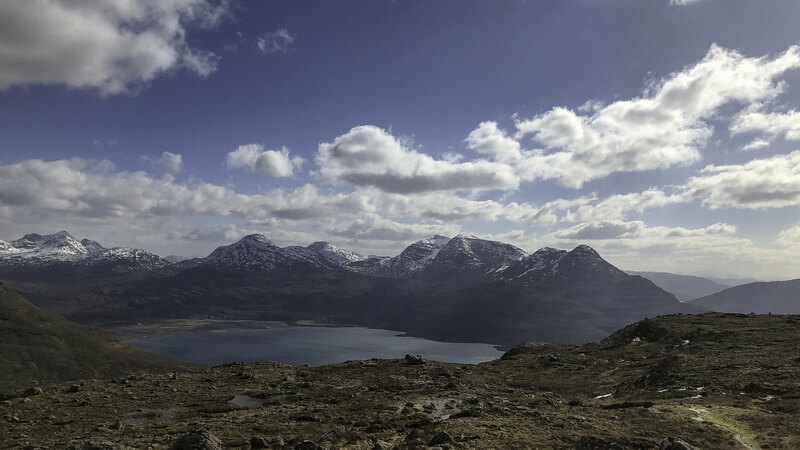 We heard a few folks mention Deep South Gully when in Torridon earlier in the month. Looks well worth doing. Interesting to see another aspect of what is possibly my favourite Scottish hill, not that I will be following in those footsteps. Very nonchalant the way you stomp up there with one axe and flying your drone the same time. dogplodder wrote: Wow. Amazing. Superb. Nowhere in the world like the Highlands of Scotland. dav2930 wrote: Great report and vid. 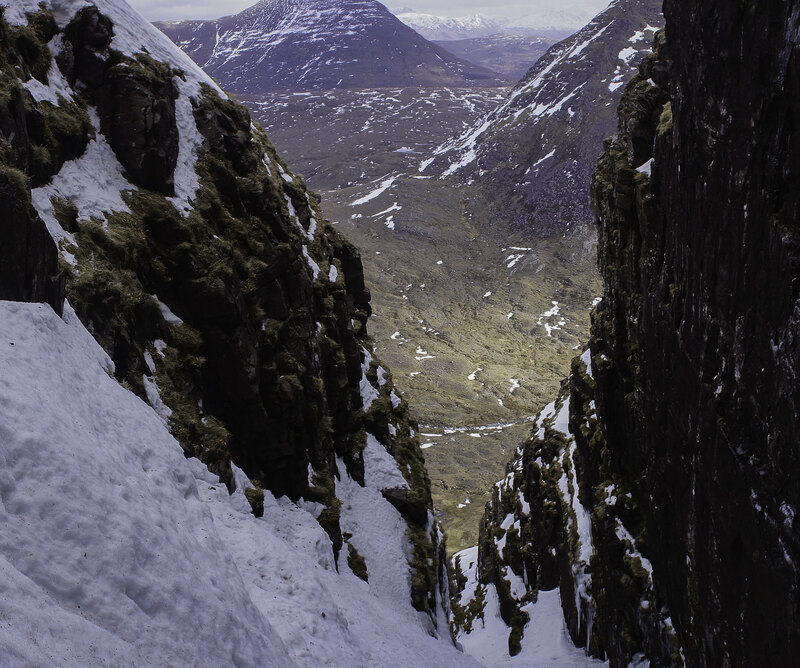 We heard a few folks mention Deep South Gully when in Torridon earlier in the month. Looks well worth doing.